Marion County, Florida — A DUI arrest is made after Sheriff Chris Blair spots a reckless driver. On Monday, September, 16, 2013, Marion county Sheriff, Chris Blair was traveling along Highway 326 when he spotted a vehicle traveling westbound in a very reckless manner. Sheriff Blair called for a patrol unit as he followed the vehicle which turned into a Sweet Bay shopping center at the corner of Highway 326 and North US Highway 441. Blair continued watching the vehicle until a deputy arrived to the Sweet Bay parking lot. Due to the Sheriff observing the vehicle traveling erratically, Deputy Mitchell Sorrells was able to conduct a traffic stop on the male driver later identified as 23-year-old, Andrew R. Adair. Adair was behind the wheel of his black 2011 Mitsubishi when the deputy approached the driver. According to reports, when the deputy made contact with Adair, his eyes were glassy, watery, and his speech was slurred. The arrest report noted that when the deputy had Adair exit the vehicle to conduct a field sobriety test, there was a strong odor of alcohol coming from Adair’s person and breath. 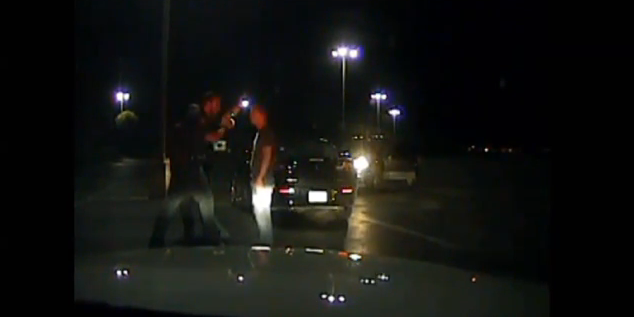 A field sobriety test was performed in which Adair failed multiple portions of the test. At one point as seen in the video, Adair even fails to follow simple instructions. An inventory of the vehicle also turned up nine empty Bud Light beer cans. Adair was placed under arrest and taken to the Marion County Jail, where he performed an alcohol breath test, blowing a .167. He was booked for DUI and released a short time later on a $500 bond.